A retrospective is a backward looking, or looking back of a thing with hindsight. A retrospective exhibition shows the development of an artist’s work over a period of time. For example the Tate Modern had A Retrospective Exhibition on Roy Lichtenstein one of the great American artists of the twentieth century. The exhibition showcased some of his works and influences. Lichtenstein grew up in New York City in the 1930s, the heyday of art deco, where the sleek lines and decorative panels of landmarks such as the Chrysler Building (1930) and the Empire State Building (1931) were familiar to him. When in 1966 he was commissioned to design a poster for the city’s Lincoln Center, he turned his focus backwards 30 years to use an outmoded architectural art deco style as the basis for the poster. This was the starting point for a series of paintings and sculptures that he called his Modern series. While much of his art derives from specific sources, these works refer to a design style. Lichtenstein was fascinated with art deco’s merging of ornamentation and mass production, but he also humorously described it as “Cubism for the home”: he felt that it had domesticated Picasso’s radical reshaping of our perception. Another exhibition of the same nature at the Tate which is yet to be revealed to the public in 2014 is that of Richard Hamilton (1922 – 2011), one of Britain’s most influential artists of the twentieth century, who is also widely regarded as a founding figure of pop art. The Tate Modern will stage the first retrospective to cover the full scope of Hamilton’s work and explore his relationship to design, painting, photography and television, as well as his engagement and collaborations with other artists. To bring things closer to home, a year ago the National Gallery of Zimbabwe exhibited a body of work in an exhibition entitled Nicholas Mukomberanwa, A Retrospective. This was the National Gallery’s first Retrospective Exhibition of Nicholas Mukomberanwa since his death, one of Zimbabwe’s most notable figures in stone sculpture. Bringing together more than twenty works and original drawings, the exhibition presents a comprehensive overview of his work from the 1950s until his death in 2002. The exhibition consisted of sculptures and drawings, and some never seen before pieces that all tied in together spoke volumes about the artist and his work ethic and methods. It was of works that are housed in the National Gallery of Zimbabwe Permanent Collection, Chapungu Sculpture Park and the Mukomberanwa family. Mukomberanwa was a man who worked tirelessly on perfecting the immense body of work he left behind, a testament to the drive and passion he felt towards the art of sculpting. Another retrospective exhibition at the National Gallery of Zimbabwe was an exhibition by Malangatana Valente Ngwenya in 2011. This show consisted of works that were part of the National Gallery of Zimbabwe’s Permanent Collection and works brought in from various private collectors as well. However retrospectives run the risk of not being fully reflective of the artist’s work over their career span, but in this particular one, the work is representative of the past years in which he has been making work. It serves as a good barometer and commendation of his work. This article serves as a celebration of Thakor Patel and the work he has done since he moved to Zimbabwe after independence. This November the National Gallery of Zimbabwe presents Thakor Patel, A retrospective with the artist’s work spanning over five decades taking centre stage. Thakor Patel of Indian heritage grew up in India and later moved to Zimbabwe after independence where he fell so in love with the country that he felt he wanted to stay. Patel started making art at a tender age; he remembers standing in the classroom trying to rub a painting and the paint spilling onto the paper – to the amusement of the others. The papers kept slipping and he tried to regain his balance as his crutch knocked about at his side. He had had his leg amputated when he was 11 years old after four years of knee trouble. That classmate scene was a turning point in his life, from that day on he was determined to be the best that he can be artistically, that he wouldn’t let his disability affect the artist that he became many years later. “I felt inside so much that I must be an artist. The teacher and the pupils were laughing. I decided from that day that I must learn. It was a big fight with challenges. He had to prove to the world that he could do it despite all odds. There are over 100 pieces on show and the work being exhibited is housed in private collections and the collectors were ever so generous to allow us the opportunity to put this wonderful body of work together under one roof for this period of time. Patel works with linear references in his work a sense of geometry that reflects the subject in which he is trying to express to the viewer. Patel feels that abstract art is natural growth. There are African influences that can be seen throughout his work, shown through African motifs that are prominent features in his paintings. His technique over the years has improved and overlapped with his broader treatment of subject matter that always involves a narrative matter. His work allows the viewer to question and engage in its simplicity and minimalist approach. 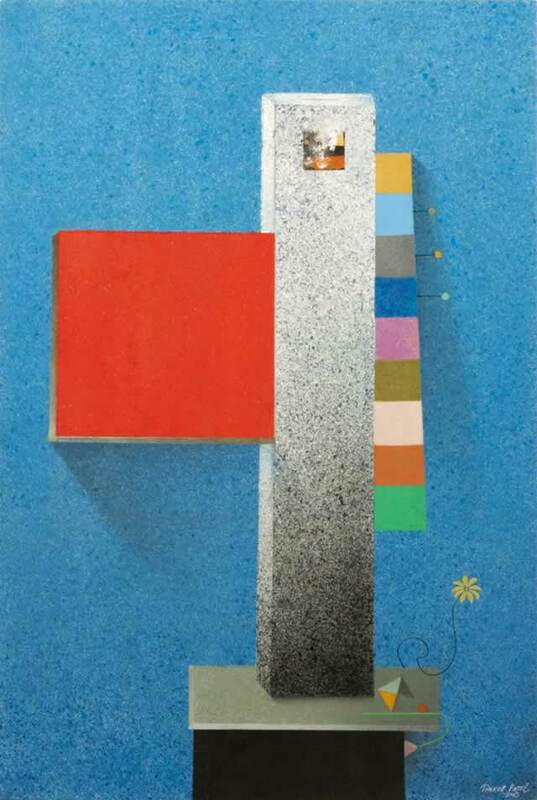 He has a very liberated approach towards his work, in particular his use of colour and shapes. The show is up until the 6th of January 2014 at the National Gallery of Zimbabwe, in the South and East Gallery spaces. Entry into the gallery spaces is US$1 per person and 50cents for children under 12.